The bread-on-breading combo of a fried chicken sandwich may seem like it might not fly in a sometimes carb-averse town like Los Angeles. 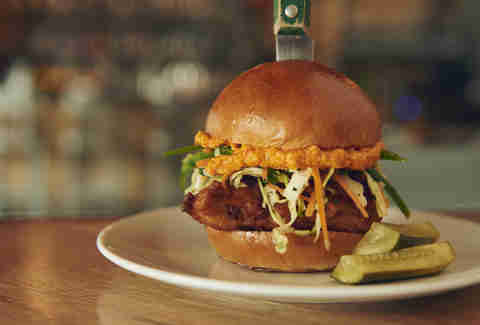 But thankfully chefs around the city have recently raised the bird to the paleo police and given the people what they want: unique takes on the formerly humble (and always-delicious) fried chicken sandwich. 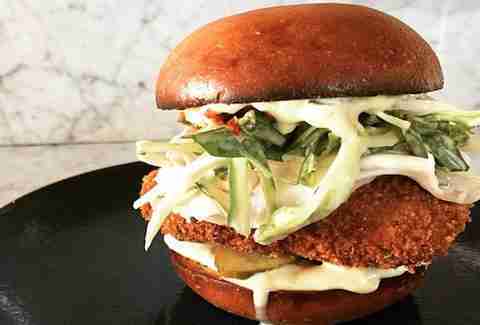 From new birds in the hen house to several that are still ruling the roost, here are the best fried chicken sandwiches in LA that are worth a cluck. This upscale gastropub continues to hold it down with its excellent, ketchup leather-topped burgers, but you’d be missing out if you didn’t get on board with the Southern Fry. This formerly feathered friend features a fantastically smoky fried Jidori chicken breast that’s been cold-smoked, buttermilk-brined, coated with rice flour and secrets and fried in -- wait for it -- beef tallow. This work of art is then topped with duck breast ham, spicy green pimento cheese, and house-made pickles that are seasoned with kombu for an extra umami-kick, all held together by a hearty house-baked bun. Head to the stunning rooftop of this buzzy West Hollywood two-part outfit, where you’ll find the recently expanded LP menu now includes a knockout fried chicken sandwich. Available in regular or spicy habanero format (pro tip: make it spicy!) 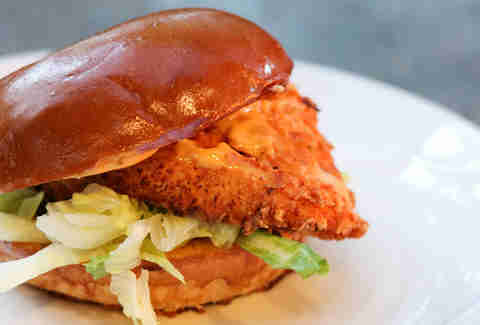 the LP entry features crisp and peppery fried chicken breast, romaine, house mayo, and a squishy and buttery bun. Trust us, you will likely find yourself ordering a second before the first is even finished. Nashville Hot Chicken is sort of a big deal these days. And short of hopping a plane to Tennessee, you can get your fix of the fiery fried chicken at Howlin’ Ray’s, a food-truck-turned-brick-and-mortar in Chinatown’s now-bustling Far East Plaza. And while you should definitely carve out some time for a box of the wings and weekend waffles (just be ready for a long line), don’t pass up the chance to devour the shop’s beast of a sandwich. 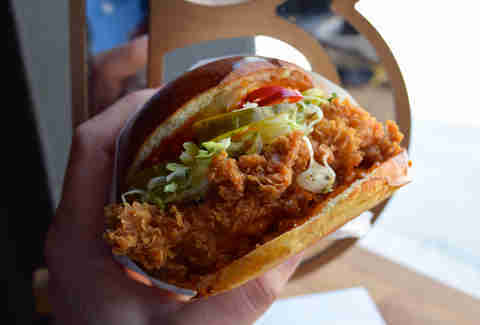 You’ll find a huge boneless breast with a thickly crunchy and garlicky crust that is spiced with traditional cayenne as well as habanero, ghost pepper, and the intense red savina, all of which is balanced by sliced pickles, cole slaw, and the house “comeback” sauce on a toasted and buttered bun. You can choose your heat level from a six step scale, though if you go for anything above the medium be prepared to make frequent use of the free refills of lemonade and peach iced tea, and quite possibly some tears. There are plenty of excellent choices on the brunch menu of this newish Studio City favorite, but your mind should already be made up to order the Nashville Hot Chicken sandwich (along with the mini-burger-adorned Bloody Mary). Stacked high with huge hunks of delicately crispy chicken, it comes with a house-made pimento cheese, a tangy green tomato chow chow, all served on a buttery roll. While this swank, date-friendly destination may call the fried chicken sandwich by another name -- the Chicken Milanese -- it still tastes as sweet, er, savory. The Italian-influenced variation features an excellently crisp, breadcrumb-crusted chicken cutlet topped with slices of prosciutto cotto, a puntarelle slaw, pepperoncini, and spicy mayo for a perfect zing with a house-made brioche bun to round out the delicious picture. This recent and welcome addition to Beverly Blvd brings a Taiwanese twist to the typical chicken and bread combo with their Night Market fried chicken sandwich. You’ll find a flattened and deep-fried, organic chicken breast topped with pickled mustard greens, a sweet mayo, cilantro, and a house-made scallion bun that’s like a brilliant cross between an English muffin and a scallion pancake. Pro tip: turn up the heat again with a splash of the house simbal sauce. 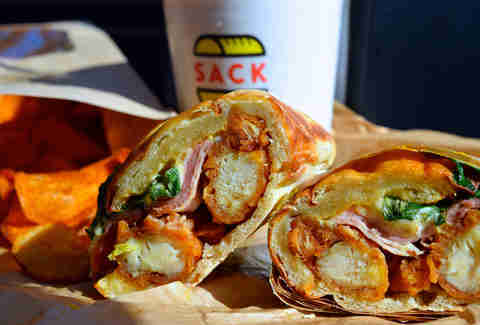 With a name like “The Best Damn Chick’n Sandwich Y’ever Had,” you’d hope that the sandwich would deliver big. And thankfully at this Studio City BBQ joint, it does. Now available at dinner as well as lunch, this crispy, fried beauty comes with pimento cheese, jalapeños, cole slaw, and is served on a fluffy and buttery milk roll. Is it the best damn one? Your call, dude. This roving truck turns out a flock of tasty brunch-friendly dishes, but the one that has the crowd clucking is the Original Free Range LA chicken sandwich. 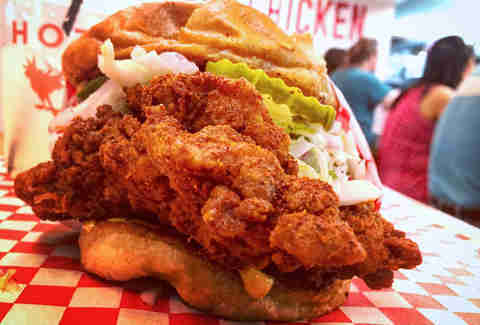 A golden tempura-battered shell locks in tender, sustainably raised meat, while a fresno chili slaw and a whole grain honey mustard sauce brings a touch of heat and tang, and a fluffy, toasted Portuguese bun keeps the bird from flying the coop. Formerly known as Mabel’s, this small and stylish downtown joint may have swapped out waffles for donuts, but it thankfully held on to its excellently crunchy fried chicken. While you could opt for the original version of the fried chicken sandwich, we recommend going for the (surprise, surprise) Birdies Spicy. You’ll find a hearty breast of Mary’s free-range chicken that’s been breaded with King Arthur flour and fried using a pressure cooker, then topped with a light cabbage slaw, pickles, Tillamook pepper jack, and ghost pepper mayo, all sandwiched by a homemade bun. You may know this NY-import for its top notch sushi and Japanese small plates (Oxtail fried rice! ), but those in the know set their sights on the glorious fried chicken. Now available in convenient sandwich form, the Fried Chicken Slider stands out from most with a light and crunchy crust made from matzo meal and spiced with togarashi and other Japanese spices. It’s topped with wasabi mayo and uniquely served on crispy rice patties instead of a bun. 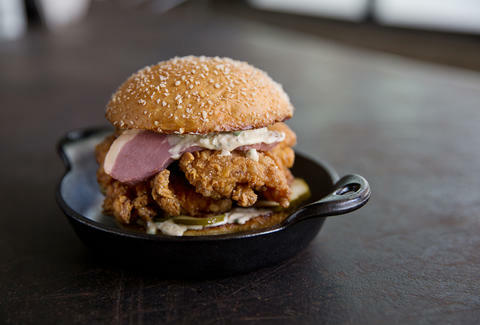 While you may expect most fried chicken sandwiches to be served hot, Chef Michael Voltaggio won’t be penned in by your expectations: at his two casual outposts (one on Sunset and the other on Melrose) the Top Chef winner serves up his famous Cold Fried Chicken sandwich, featuring chicken that has been cooked sous-vide then lightly fried and served with ranch cheese, lettuce, pickles, and hot sauce, and served on house-baked ciabatta. And now he’s added the excellent cordon bleu to the mix as well, which features the same great fried chicken along with ham, Swiss, arugula, mayo, and Dijon mustard. They’re not huge sandwiches, but that’s all the more reason to order both. This brightly painted Thai hotspot in Silver Lake adds a Southeast Asian spin to a Southern classic on the lunch menu (if you ask nicely, they’ll do it as an off-menu option at dinner, too). The towering sandwich features a Northern Thai-style fried thigh on sliced tomato and house ranch, and topped with a spicy papaya salad-slaw, cilantro, and jalapeños. Whether you show up for lunch or brunch to this adorable Atwater Village favorite, you’re in luck. 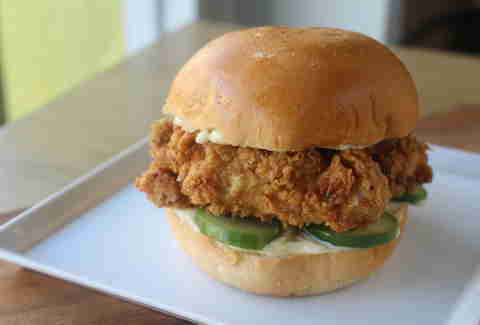 At lunch, you’ll find a fairly straightforward -- though still totally tasty -- option with a crunchy fried chicken breast, mayo, and pickles on a seeded brioche bun. Brunch-goers are treated to the same delicious chicken, but this time with the bright acidity of pickled green tomato, red onion, mayo, and a toasted brioche bun. While much of the menu at this Melrose spot from wunderkind duo Jon and Vinny tends to skew towards seafood, they fortunately made room for chicken of the land as well. This hulking fried chicken sandwich comes with a spicy bread & butter pickle slaw, a vinegary slaw, Sriracha aioli, and a steak knife in case the thing tries to fight back. This Los Feliz crowd-favorite also promises to have “LA’s Best Fried Chicken Sando,” and it’s definitely in the running. 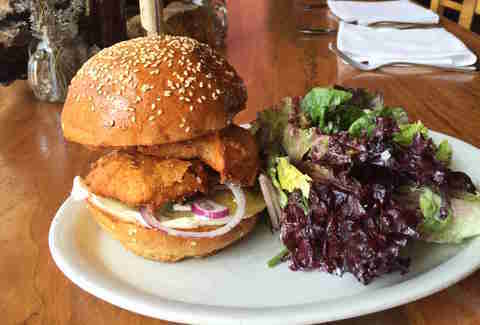 Available at lunch during the week, the sandwich features a flaky and crispy fried breast, which gets a bit of the hot honey aioli treatment and is served with lettuce, red onions, pickles, and a brioche bun. And if you swing by on the weekend for brunch you can score the “South x Southwest” variation, which is comprised of fried chicken, country gravy, bacon, egg, and cheddar, all served on a biscuit. This tiny Los Feliz outfit packs a mighty punch at lunch with its hand-torn, battered, and fried chicken sandwich, which includes oven-roasted tomatoes for a bit of smoky umami, an herbed aioli, and mixed greens for a lighter touch, all served on a French roll. Pro tip: add avocado for some sweet fattiness. Planted neatly in the Flower District, Poppy & Rose turns some tremendous breakfast options, but its fried chicken sandwich is no shrinking violet. The belle of the ball features a tender buttermilk-brined thigh, fried to a golden brown and served with house pickles and aioli on a buttery and fluffy brioche bun. Do yourself a favor, order the biscuits, too. Danny Jensen is a regular Thrillist contributor who would happily be breaded and served on a brioche bun as long as there were pickles and hot sauce involved. Find him deep fried on Twitter and Instagram.